1. It has sun and fresh air! And green things that grow! 2. There is still a working toilet with real plumbing near it! 3. You are unlikely to be mauled by a wild animal while you enjoy nature! 5. You have it filled up with funny garden products that will make everyone smile! Wait. You don't have your backyard filled up with funny garden products? Well, we need to fix that immediately. Step right this way...well, don't actually step anywhere. Scroll right this way and discover our collection of unique outdoor and garden gifts, which are great for your backyard and anyone else's! 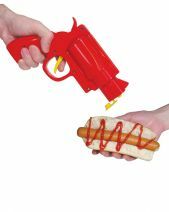 Now Laugh has put together the ultimate collection of funny outdoor gifts to make any backyard more fun! Our unique outdoor and garden gifts include a wide selection of products that anyone who owns a home can enjoy! 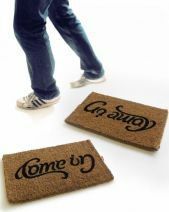 We have funny doormats with messages that will have guests snickering before they even get inside. 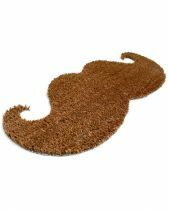 We also have doormats in unexpected shapes that will make any house the most exciting one on the block! Even the postman will be envious when he comes to bring the letters and sees one of these funny mats sitting on the stoop. But funny doormats aren't for everyone! No, some people prefer funny outdoor gifts that are a little hotter! 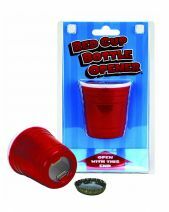 That's why we have a selection of BBQ gifts that are sure to thrill any grillmaster. 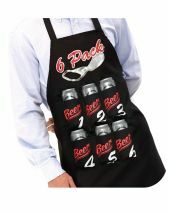 From branding irons that let you personalise burgers to barbecue tools in silly shapes to hilarious aprons to wear at the grill, these BBQ gifts are great for anyone who loves to fire up the grill and cook something delicious. Unique outdoor and garden gifts are great choices for all kinds of occasions. You can buy BBQ gifts for Father's Day, funny garden products for Mother's Day and all types of unique outdoor and garden gifts for birthdays and housewarmings. Give out garden and outdoor products for Christmas, and you'll be treating the recipients of your gifts to something they can enjoy come spring! So whether you're shopping for an avid gardener, a grillmaster or just someone who deserves to have more than a boring backyard, you're sure to find the perfect gift here at Now Laugh! Shop our collection now.